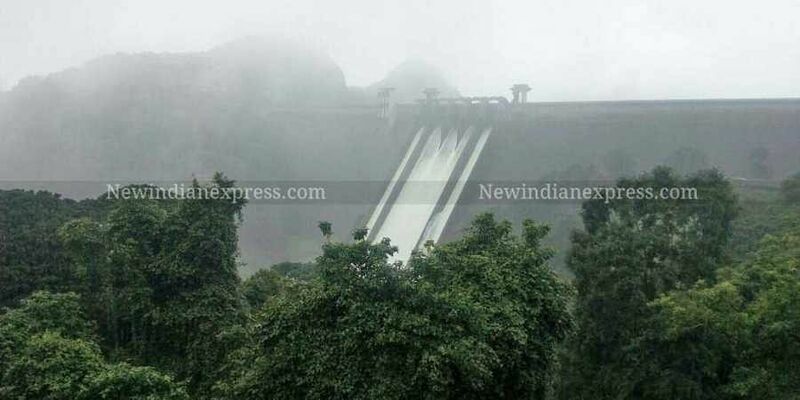 IDUKKI: With the water level rising alarmingly in the Idukki reservoir, the Kerala State Electricity Board (KSEB) has opened five shutters of the Cheruthony Dam, which is part of the Idukki Dam project on Friday to release excess inflow of water owing to heavy rainfall in the catchment areas of the reservoir in the past many days. Also, the death toll reached to 29 in the flood-hit state on Friday, as three more people died. One death each was reported from Idukki, Wayanad and Malappuram. In Idukki, the death toll reached at 12 yesterday, while two people were reported still missing. The district has received 129. 80 mm rainfall so far. Rino of Manaykkaparambil house, Panickankudy was killed in a landslip which occurred near the premises of his house on Friday. 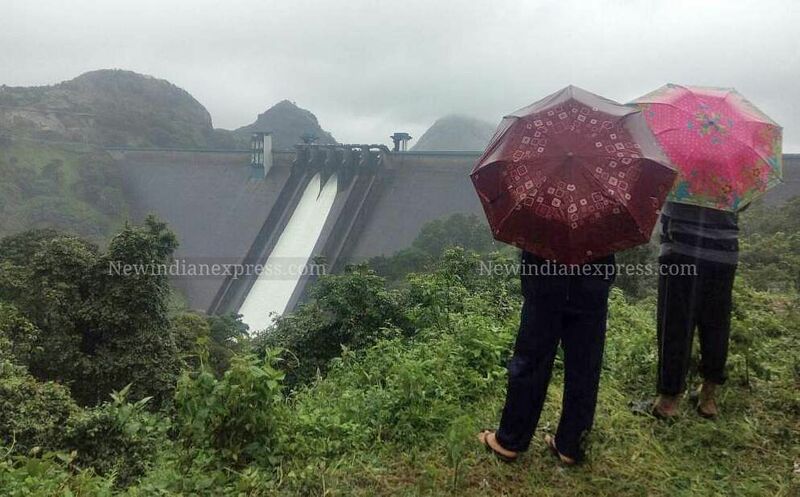 The residents of Cheruthoni, Thadyampad, Keerithodu and Karimban located in the downstream of Cheruthoni dam are still stranded as the Cheruthoni River is in full spate after all five shutters of the Idukki dam were opened on Friday at 1.40 pm. With no reduction in the inflow and the catchment area receiving heavy rainfall for the past 24 hours, the KSEB authorities and the district administration have planned to increase the amount of water being discharged from the reservoir to 600-700 cumecs (6,00,000 -7,00,000 litres per second), step by step. The water level in the reservoir stood at 2,401.60 ft against a full reservoir level of 2,403 ft. Of the five gates in the dam, one was opened on Thursday for a trial run and three on Friday morning. The 4th and 5th shutters were opened on Friday after 1.30 pm, when the water level was rising at an alarming level. Meanwhile, the district administration has deployed a police team of more than 900 members across the district, apart from a 50-member National Disaster Response Force to help in case of emergency. The Cheruthoni River has flooded the Cheruthoni bridge as well. Several uprooted trees which blocked the bridge were removed by the Fire and Rescue Services personnel. However, with the opening of the shutters, the water level has risen beyond control, and will soon submerge the Cheruthoni town as well. If the bridge submerges, the Idukki- Kattappana main road and the Thodupuzha- Puliyanmala Road will be cut off and crops on hundreds of acres are likely to be inundated. The shutters of the dam, which had not been opened since 1992 owing to the lack of monsoon shower in the catchment area of the reservoir that spreads over 649.3 km2 (251 sq mi), were opened after 26 years. The South-west monsoon has been vigorous over Kerala resulting in heavy rains in various parts of the state since the past two days. A 47-year-old man drawing water was killed when the well caved in due to heavy rain at Palavila near Pirappancode on Friday morning. As water gushed out of the Idukki dam, low lying areas in Cheruthoni including Karimban and Thadiyambad were inundated. Some houses on the banks of the river were flooded. The inmates of these houses were shifted to relief camps. Relief camps were opened at Keerithodu and Murikkassery near Cheruthoni. According to KSEB officers, the Idukki dam is receiving an inflow of 455 cumecs on Friday morning, while the outflow is only 125 cumecs. As the water level in the dam has touched 2401 feet, more water has to be released to avoid overflowing. A decision will be taken only after reviewing the flood situation downstream. Meanwhile, Cheruthoni police have diverted vehicle traffic on Kattappana Road through Karimban - Thopramkudi road as the bridge at Cheruthoni may submerge if more water is released. The water is flowing 3 feet below the Cheruthoni bridge. The water release has caused extensive damage to crops. Chief Minister Pinarayi Vijayan had described the flood situation in the state as "very grim" and it was for the first time in the history of the state that 24 dams had been opened at a time following the water level reaching maximum capacity. Prime Minister Narendra Modi spoke with the Kerala Chief Minister yesterday in the wake of heavy rains and floods in the state, and offered all possible assistance to those affected. The personnel of Army, Coast Guard and National Disaster Response Force (NDRF) have been carrying rescue and relief operations in the flood-hit areas.